Adhesive microscope slides are coated placing a permanent positive charge on the microscope slide ensuring a firm electrostatic attraction to the slide of frozen tissue sections, cells and cytology preparations binding them to the glass surface. The amino groups on the surface is consistent over the entire surface of the adhesive slide and the chemical chain structure is formulated for optimal binding capacity. 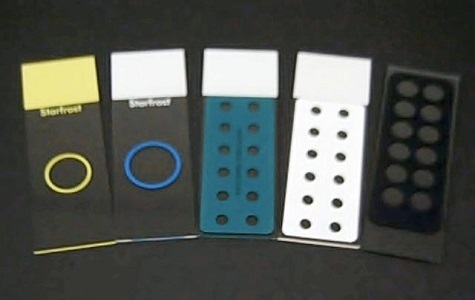 The adhesive microscope slides prevent the loss of tissue sections and cells from floating off the slide during frequent washing when carrying out immuno-histochemical staining. Adhesive microscope slides are ideal for routine histology. These slides provide superior cell and tissue adhesion and save laboratory time and money eliminating the need for extra adhesive or coating techniques with a permanent bio-adhesive. Adhesive microscope slides are ideal for optimizing section adherence for in-situ hybridization.